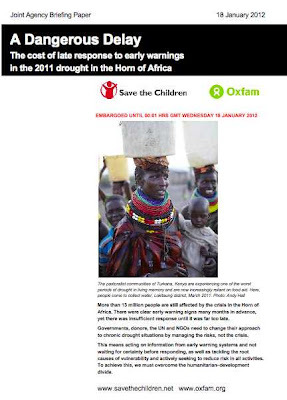 "...it took more than six months for aid agencies to act on warnings of imminent famine. Between 50,000 and 100,000 people died in Kenya, Ethiopia and Somalia. The agencies say governments, donors, the United Nations and NGOs need to learn from the mistakes. In a report titled A Dangerous Delay, the agencies say a culture of risk aversion stalled a large-scale aid effort. They say part of the problem was that the governments of Kenya and Ethiopia were unwilling to admit the scale of the disaster, but also that aid agency staff felt they had seen the problem many times before. "Many donors wanted proof of a humanitarian catastrophe before acting to prevent one," the report says. "Sophisticated early warning systems first forecast a likely emergency as early as August 2010, but the full-scale response was not launched until July 2011." By that time it says, "malnutrition rates in parts of East Africa had gone far beyond the emergency threshold and there was high profile media coverage of the crisis."